Position the mouse pointer over the style you want to change. Don’t click, which selects the style. Instead, hover the pointer in the style’s entry and a menu button appears on the right. The Modify Style dialog box appears, although it’s the same Create New Style from Formatting dialog box, just with a shorter name. The Modify Style dialog box is the same as the Create New Style from Formatting dialog box. 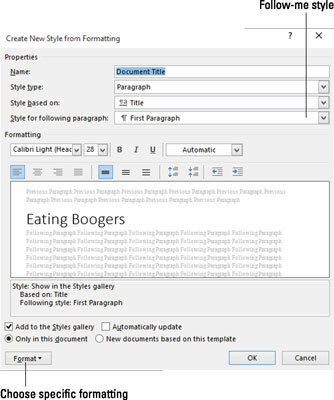 Use the Format button to alter specific styles: font, paragraph, tabs, and so on. You can even add new formatting options or assign a shortcut key. Modifying the style affects updates text with that style applied. For example, if you change the font for your Figure Caption style, all figure caption text changes at once. That’s the power of using styles.